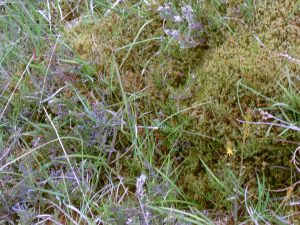 This photo has a lizard just to left of centre, taken at probably 400m above sea level in the Scottish Highlands, July 2007. The photo was taken with a simple digital camera, no chance to focus or prepare shot as the target moves too fast! I'd be interested in a positive ID, and also how common are lizards at these heights in Scotland?